Here's a page to the fur-members that have touched our hearts, and have left us to go to the Rainbow Bridge. Losing a pet can be heartbreaking. You might find it helpful to read a soothing pet poem during the rough times and it may help to know that we have been in your shoes and grieved deeply too. If you have a pet you would like see on here to keep her in loving memory, please feel free to email us and I would be gladly post a photo for you, just include your pet name and any details you would like to share! food, water and sunshine and our friends are warm and comfortable. 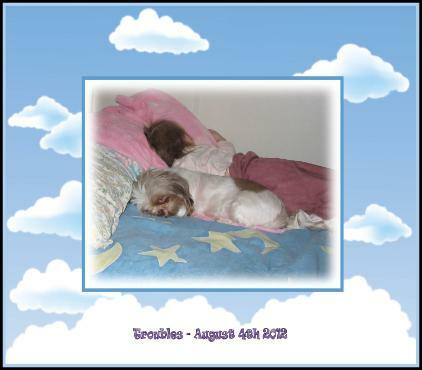 We lost our beloved dog of 15 years, named Troubles - photo of her sleeping with our 12 month old son... She have had heart failure and our Veterinarian only gave her a short time, but she lived 2 years after being diagnosed. She was such a wonderful dog and loved our children so much and loved playing with our kitties. She will be greatly missed. of the family you left behind. "Troubles" We love you and will miss you dearly.